Most of the past 7-10 days has been not just okay, but even great, as I'm mostly-convinced I'm pregnant and have been feeling fantastic. 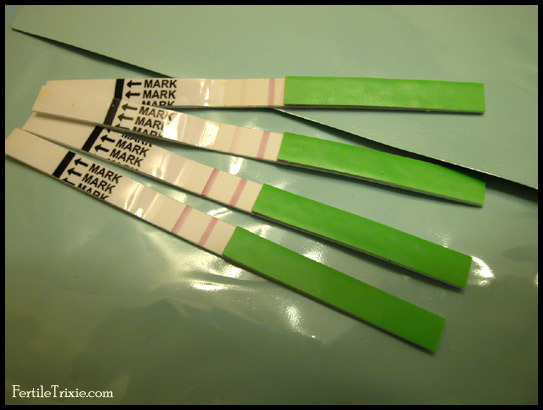 We've taken a couple of tests too-early, though, and I hate seeing those blank white looks where a positive line should be. I'm having a hard time motivating myself to do anything; all I want is to know for sure. RIGHT NOW. I know a lot of people get negative results on home pregnancy tests before they get positives due to a similar impatience or diluted urine or whatever. That knowledge is not a real big consolation, though. My skin is pimplier since going off the pill. I have a constellation of zits on my chin. I wonder if this means I am having PMS / my period is going to start. If so, then I'm not pregnant. Going to test for it next week if my period doesn't start by, say, Wednesday.